During of our storm chasing tours, we conduct “mini lectures” to help further your education of meteorology. During our “Lecture Tour,” we get much more in-depth where you will learn about advanced forecasting techniques, but more importantly you’ll receive the information to help you understand the methodology behind these techniques. For example, CAPE (Convective Available Potential Energy) is an important parameter to look for when forecasting. But, just reading it on a chart is pointless if you don’t understand what it actually is. Our tours are great ways to learn because you’ll see the information on paper (or a digital screen) and put that daily information to work in the real world by seeing it play out in the atmosphere before your eyes! There are four main types of thunderstorms. They are: Ordinary “pulse” Storm, Multi-Cell Cluster (MCC), Multi-Cell Line (“Squall Line” or “MCS”) and the Supercell. Let’s take a brief look at what each of these thunderstorm types are, so that you’ll know them when you see them while storm chasing on a tour. As the name implies, there is usually only one cell with this type of thunderstorm. Also called a “pulse” thunderstorm, the ordinary cell consist of a one time updraft and one time downdraft. 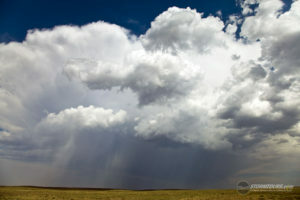 In the towering cumulus stage, the rising updraft will suspend growing raindrops until the point where the weight of the water is greater than what can be supported. At which point, drag of air from the falling drops begins to diminish the updraft and, in turn, allow more raindrops to fall. In effect, the falling rain turns the updraft into a downdraft. With rain falling back into the updraft, the supply of rising moist air is cut-off and the life of the single cell thunderstorm is short. These storms are short lived and, while hail and gusty wind can develop, these occurrences are typically not severe. Still, if atmospheric conditions are right and the ordinary cell is strong enough, there is the potential for more than one cell to form and can include microburst winds (usually less than 70 mph) and weak tornadoes.